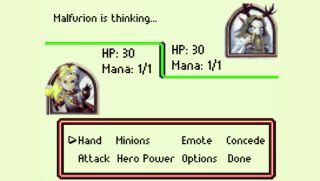 Have you ever wondered what Hearthstone would look like as an old-school trading card game on your GBA? Wonder no more, because YouTube user Roflstone has made it happen. The match depicted in the video pits Priest against Druid, and follows a perfect sequence of plays that leads to victory for... well, I don't want to spoil it. Suffice it to say that this is the full-on Hearthstone experience, rendered exactly as you'd expect to see it on your yesteryear handheld of choice. Nicely done, sir!